Resources - Beacon - A Hill of Beans! Did you get free beans from us? Can't remember what the variety was? The pole bean packets were marked with a P.
55 days. Standing out above all other French/filet beans, Velour's royal, deep purple color and equally satisfying flavor make this the epitome of luxury in a vegetable. 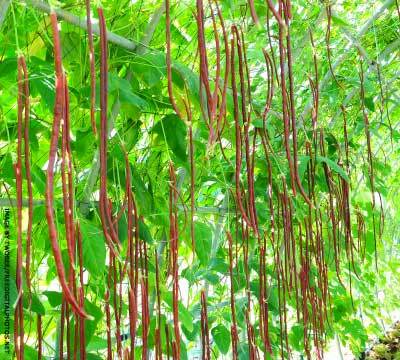 The slender, smooth, round pods are straight growing about 5 1/2 inches long. Compact, disease-resistant buses produce heavy crops of gorgeous sumptuous, stringless beans over an extended harvest period. With its extra fine texture and taste, Velour makes a delightful fresh eating bean and also freezes exceptionally well. When cooked, the purple color changes to a brilliant green. 50 days. Outpacing most other green beans in our trials, Speedy showed incredibly high productivity early in the season with light green, straight pods that load up the bush-type plants. The beans are exceptionally tasty, well filled-out, round, and virtually stringless, too. Speedy's super efficient maturity, rich flavor, and high yields make it an exceptional variety. White seeds. We'll keep adding tips and links to help your garden grow. For even more helpful tips from WSU, check out this link. Are you hooked? Check out this great list of seed catalogs from the King County Master Gardeners to check out all the different varieties available.